The candle holder was designed uniqueness in Eastern Asian style with Tropical plant. This is handcraft with 100% natural raw material. The body made of dried banana leaf to shows the beauty of the natural texture in itself with papermache process. Inside surface lined with multi layers of high quality golden leaf by our identity technic for durability adherent. 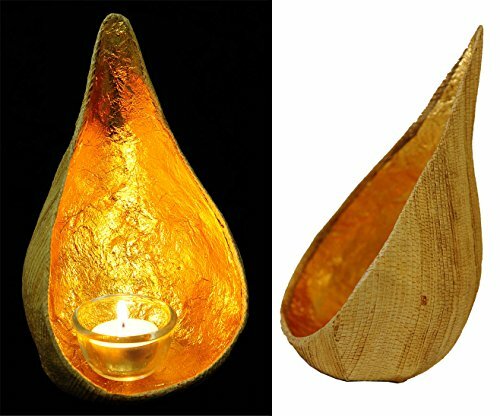 Apply by put the tea light cup inside, the candlelight will reflect the surface of the gold to get a luxury brilliant effect. This illumination suit for use indoor area in creating a relaxing or romantic atmosphere. This can be used to decorate on the dining table, taken lineup as a pattern to highlight the interior design such as spa, restaurant or hotel. Made of natural dried banana leaf and gold leaf lining. Available for indoor area to create a relaxing , romantic atmosphere by glowing in the dark area. Decorate as a wall accent lamp in variance spaces such as spa, restaurant or hotel. Produce and Ship from Thailand via registered airmail with tracking number 2-4 weeks or less than to delivery. If you have any questions about this product by Exotic Chic Decor, contact us by completing and submitting the form below. If you are looking for a specif part number, please include it with your message.